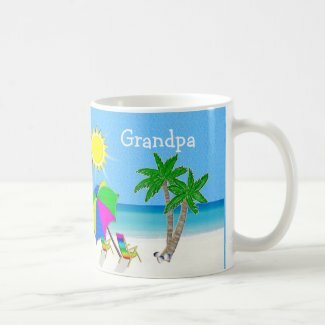 Grandma Mugs, personalized mugs for grandparents with a cheery Beach theme will brighten anyone's day. Grandma Mugs are Great Gifts for Snowbirds and Beach Themed Coffee Mugs, GRANDMA Mugs or Anyone because these are Customizable Mugs. Change “Grandma” to “Grandmother” or ANY Name.. TYPE Your NAME in the TEXT BOX located in “Personalize it” section to the right of these Beach Mugs for Grandma. If you are looking for Mugs for Grandparents, See the Grandpa Mugs Below. Personalized Mugs for Grandparents, Snowbird Gifts or a fond memory of the beach. Grandma and Grandpa Mugs can be Personalized Mugs for Grandparents or ANYONE. Be the first to review “Grandma Mugs Great Gifts for Snowbirds” Click here to cancel reply.